Jean McKinnon has been active all her life. She played tennis and walked everywhere. 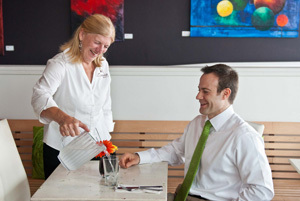 However, severe hip pain over the last five years began to impact her work as a waitress. Because she didn’t have health insurance, she kept working and ignored the pain as best she could. That all changed when Jean’s primary care physician referred her to Project Access Northwest (PANW), which referred her to Virginia Mason. Thanks to the Project Access Northwest partnership with Virginia Mason, Jean McKinnon returned to work after successful hip surgery and shares a laugh with her orthopedic surgeon, Jonathan Clabeaux, MD. “Jean had very advanced, severe arthritis of the hip. When arthritis is that advanced, there is nothing short of a hip replacement that will treat it,” says Jonathan Clabeaux, MD, Virginia Mason orthopedic surgeon. Through a partnership with PANW, low income, uninsured patients who receive primary care in the community clinic system can now be referred to Virginia Mason for specialty care services. PANW screens and arranges testing, laboratory and imaging services before the patient arrives at Virginia Mason — a model of care that removes the typical barriers preventing patients from keeping their appointments. In fact, more than 95 percent of PANW patients keep their appointments, compared to fewer than 70 percent in typical uninsured populations. Four weeks after surgery, Jean was back to work. Virginia Mason helps support PANW’s operating costs and covers the cost of services PANW patients receive. Virginia Mason treats patients referred by PANW from community clinics in King and Snohomish counties. « Playing Golf: When Should You Get Your Child Started?